URBANA, Ill. - As the weather begins to warm up, wheat is beginning to grow at a faster pace. Symptoms of some diseases are also beginning to appear or will likely be appearing soon, said a University of Illinois Extension plant pathologist. Stagonospora and Septoria leaf blotch: Although caused by two different pathogens, symptoms of these two foliar diseases look very similar, and both can be managed with an appropriate foliar fungicide application. Bradley explained that most results from U of I wheat foliar fungicide trials conducted since 2008 have shown that an application of an effective fungicide for control of Fusarium head blight (scab) when wheat is beginning to flower also provides good protection against common foliar fungal diseases on the flag leaf. “However, if a variety is very susceptible and if conditions are favorable (frequent rainfall/damp conditions), then an application of a fungicide when the flag leaf emerges may be needed,” Bradley said. The 2015 multi-state university foliar fungicide efficacy table for wheat diseases can be found here: http://bulletin.ipm.illinois.edu/?attachment_id=3142. Virus diseases: Surveys of viruses affecting wheat in Illinois conducted in recent years indicate that Barley yellow dwarf virus (BYDV) is the most commonly detected virus affecting wheat in the state. However, other viruses, such as Wheat spindle streak mosaic virus (WSSMV), Soilborne wheat mosaic virus (SBWMV), Wheat streak mosaic virus (WSMV), and a few others also have been detected. Bradley said virus symptoms (yellowing, purpling, yellow streaks, etc.) can be confused with other diseases and disorders, and it can be extremely difficult identifying a virus disease by symptoms alone. “Specific laboratory tests must be conducted to determine if a virus is responsible for these symptoms,” Bradley said. The U of I Plant Clinic (https://web.extension.illinois.edu/plantclinic/) does not currently test for viruses in wheat but can help make a determination if virus testing is needed, he added. Plant virus testing can be done at the Purdue University Plant and Pest Diagnostic Laboratory (http://www.ppdl.purdue.edu/ppdl/index.html) and at a private lab known as Agdia, which is located in Elkhart, Ind. (https://www.agdia.com/). “Unfortunately, no in-season control options are available for managing virus diseases,” Bradley said. Stripe rust: To his knowledge, Bradley said stripe rust has not yet been detected in Illinois during the 2015 season. “However, there have been reports of stripe rust from states to the south of Illinois, such as Arkansas and Tennessee. Because rust spores have the capability of moving many miles, stripe rust could be on its way to Illinois,” he said. 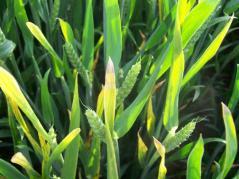 If stripe rust is observed on plants, a foliar fungicide may be needed to protect the flag leaf, depending on the susceptibility of the variety. Applications at early flowering for control of Fusarium head blight also may be effective in managing stripe rust; however, an earlier application of a fungicide may be needed if stripe rust is found prior to heading and if disease is developing rapidly. He added that the beginning flowering stage is also the best timing for applying an effective fungicide to managing Fusarium head blight and DON. Results of university fungicide trials across multiple states have shown that Prosaro (Bayer CropScience) and Caramba (BASF) are the best products currently available for reducing Fusarium head blight and DON in grain. “One thing to keep in mind with these fungicides is that 100 percent control cannot be achieved, and susceptible varieties cannot be ‘fixed’ by applying a fungicide when conditions are very favorable for Fusarium head blight. Bradley added that university research has shown that Fusarium head blight and DON can be reduced by approximately 40 to 60 percent with Prosaro or Caramba (relative to a non-treated check).